Dave and Julie had sold their home and bought their two-bedroom loft condo downtown next to Coors Field-great location, as they are both Rockies’ fans. Their kids were all settled into their millennial lives—or so they thought. Young son, Jason, realizing that living on his own was more expensive than he had thought, asked if he could move back home. Space Challenge: Where to house Jason for an extended period of time, where he could still have his own space, and his parents could still have their own space? Jason's parents second bedroom was already set up as a home office, and so they looked to their loft space, where Jason was currently camped out on an air mattress. 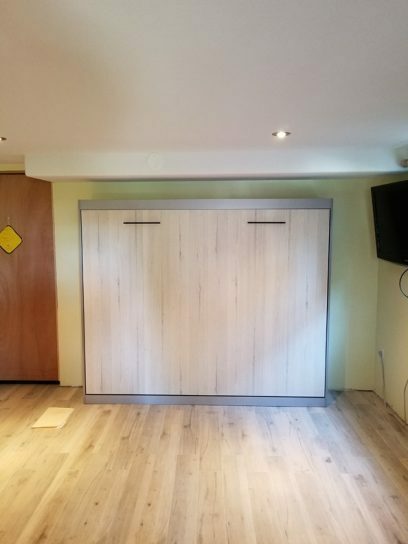 In addition to a bed that his parents didn’t want taking up a lot of space, they decided that they also wanted to add some type of custom cabinets for extra storage in the loft space. 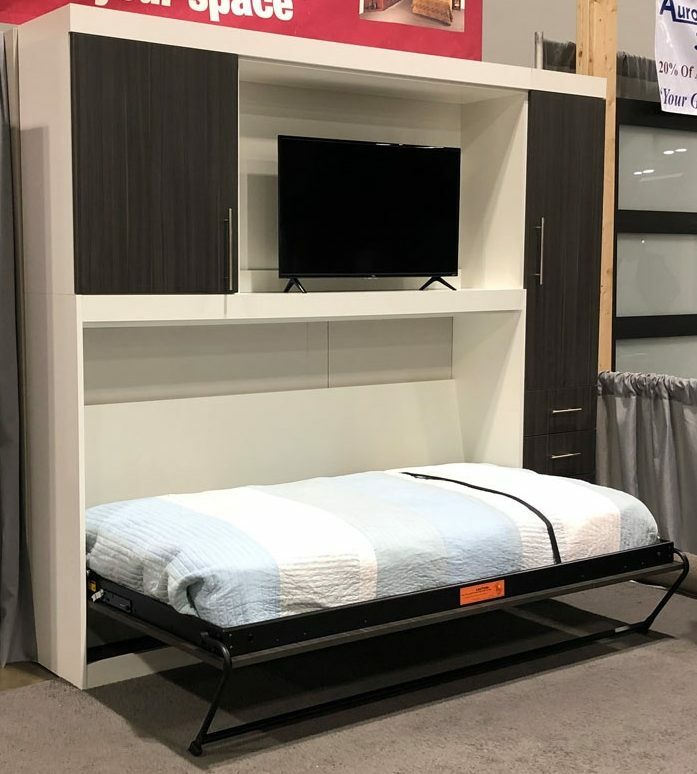 Space Solution: Dave and Julie bought a side queen size Murphy Sofa Bed which gave Jason both a place to sleep as well as to watch tv on his own. They chose a chocolate wood laminate for the bed, a platinum fabric for the sofa, and a closet cabinet for Jason’s clothes. So, by working with Smart Spaces, Jason's parents were able to customize their loft to make for a comfortable place for their "boomerang" son—although they don’t want it to be TOO comfortable! Twin Murphy Bed On Sale Now! Side Twin Bed with media & storage units. Great for teen room or basement, fits easily in 10 x 10 space. Or, click to call us NOW for more info! Queen Murphy Beds On Sale Now! 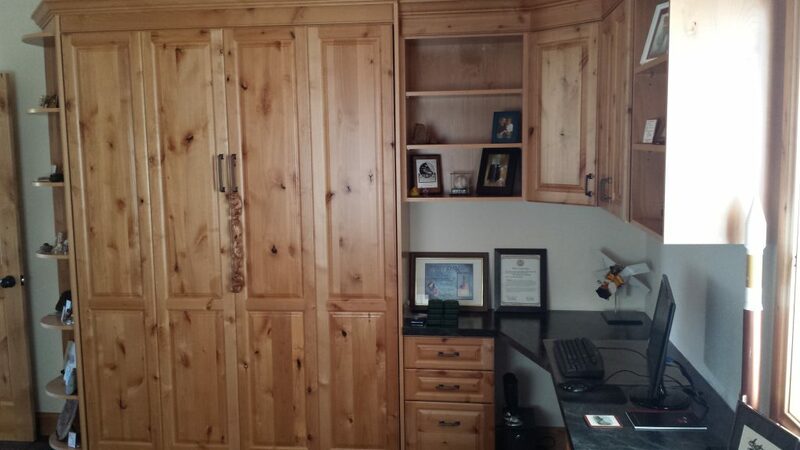 Queen Size Murphy Bed + Office: Fully loaded, easily fits in 10' x 12' room. Is your New Year's resolution to declutter? Smart Spaces Customizes Solutions JUST for You! Is your New Year’s resolution to be less cluttered and to find more space in your home? Longing to have a functional office space, instead of using just a kitchen table? Smart Spaces, your space solutions experts, has many practical ways to increase your living space—as if by magic. They employ the use of a Murphy Wall Bed—to increase your available area by as much as 352 cubic feet—by eliminating the guest bed. In addition, they will build custom cabinets to fit your room—resulting in no wasted space that's taken up by extra furniture. Our unique studio desk Murphy Bed, is attached to the wall bed panel that lays down when Murphy Bed is opened. REALIZE YOUR NEW CLUTTER-FREE LIVING SPACE, TODAY! Follow us on Pinterest for more GREAT space solutions! Everyone’s favorite time of the year is just around the corner! The holidays mean good food, fun traditions and quality time with loved ones. Who doesn’t love that? 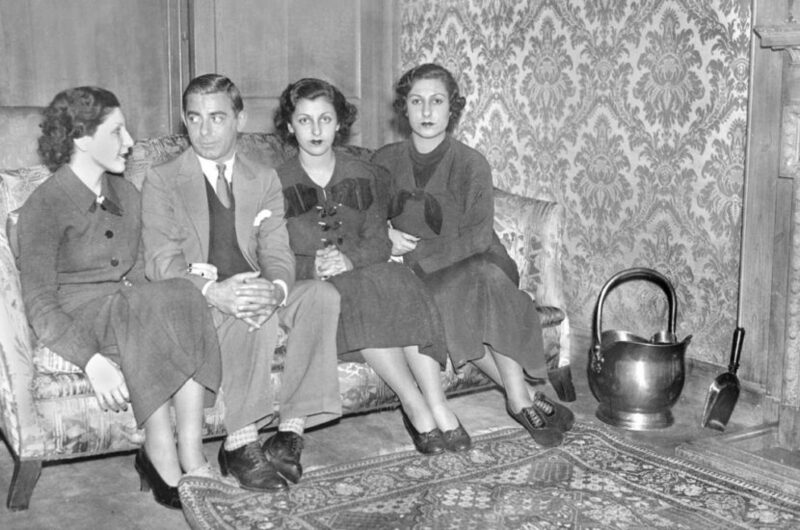 The holidays also mean relatives from out of town invading your home, cramped spaces and long lines for the bathroom. The struggle is real during the holidays. But it doesn’t have to be this way! Whether you have a mountain cabin, a cozy home or a loft in the city, this holiday season is the perfect time to offer your guests more than an air mattress and your living room floor. Check out 5 space-saving tips for surviving holiday guests in your home. Whether you have a living room, basement or home office with a little extra room, holiday visitors are the perfect reason to declutter your space. Best-selling author, Mari Kondo, has amazing tips for clearing out clutter in your home. Freeing your space of extraneous piles will help you feel more prepared to take on holiday guests in your home. 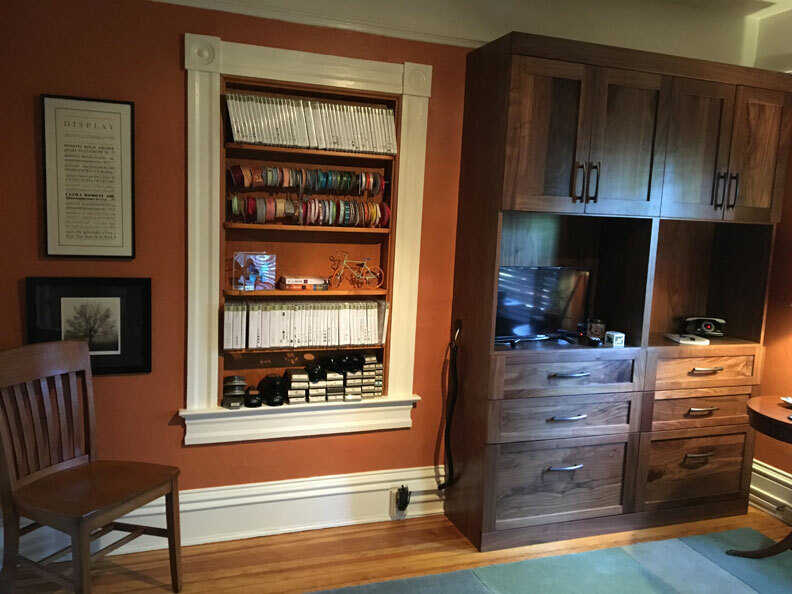 And the best part is that you can enjoy the benefits of an organized space all year round. Out of sight, out of mind. Make sure to leave space in a spare closet for your guest’s luggage. Your guests will feel more at home if they don’t have to live out of their suitcase, and your home will feel more spacious without suitcases taking up floorspace. Inflatable mattresses and sleeping bags aren’t going to cut it anymore. Your guests wake up grumpy after an uncomfortable night of sleep. You’re stuck tripping over the mattress or sleeping bag that remains strewn on the floor. The Murphy bed is a game changer. Murphy beds can be transformed back into wall space, into a desk, or even a sofa. Cabinetry such as a closet cabinet can be added that allows you to transform your space to exactly what you need when you need it. Your walls can help you save room when floor space is at a premium. Install closet cabinets with drawers and shelves so your guests can organize their belongings within reach without having to leave them all over the floor. This is especially helpful if your spare room or living space doesn’t feature any extra storage. Less is definitely more when it comes to accommodating houseguests for the holidays. 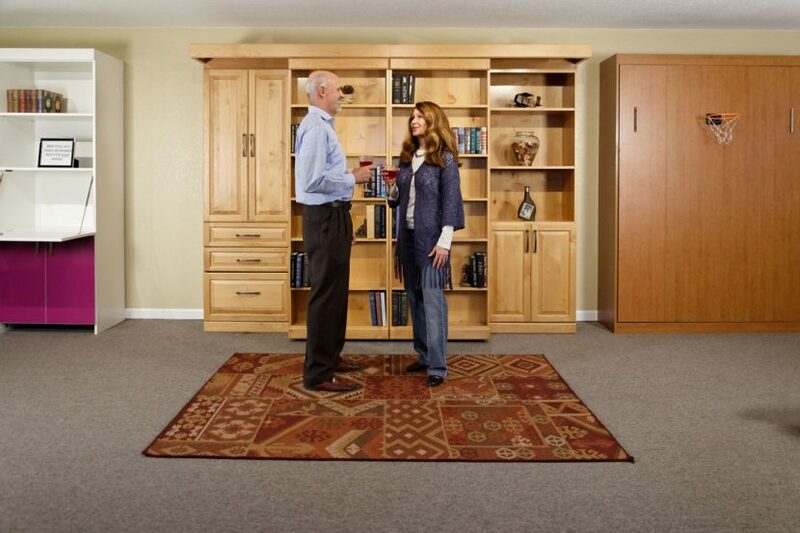 Make sure every piece of furniture you invest in serves multiple purposes – like a murphy bed. The best part is you don’t have to sacrifice style in order to save space. If you’re ready to upgrade your space in time for the holidays, schedule your appointment with Smart Spaces today! Call Smart Spaces to schedule your FREE consultation and design! 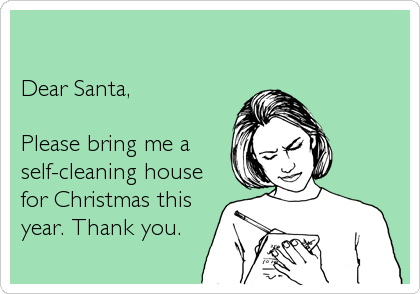 It's not too late to get ready for your guests this holiday season. PROBLEM: Jennifer and Phillip Allen recently purchased a Wash Park home built in the 1920’s. They love it, but are faced with the normal tiny dimensions of an older home, particularly in the basement with its 76” ceiling height. The color of your furniture’s finish makes a difference! CHALLENGE: Jen and Phil need a bed in the basement for the out-of-town soon-to-be grandparents who are coming in just a few weeks. Not only are the ceilings low, but the basement stairs have such a sharp turn that Jen and Phil can’t get a normal queen mattress down the steps. SOLUTION: Smart Spaces designed a simple queen Murphy side bed in smooth laminate, or white melamine, for the Allens. Having Denver suppliers and on-site manufacturing helped Smart Spaces meet the Allen’s tight time frame. 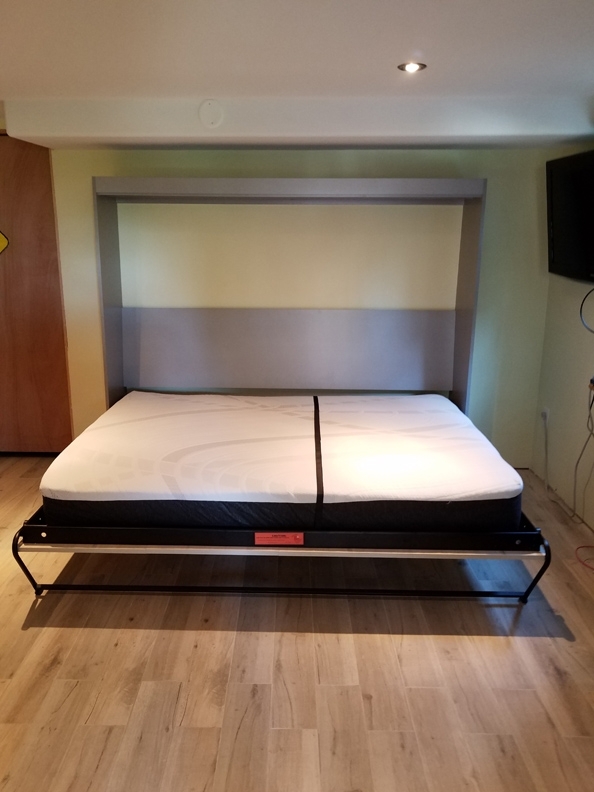 By assembling the bed in the actual basement, and by using a memory foam mattress which came tightly rolled up, Smart Spaces was able to provide the Allens with a bed in the nick of time. PROBLEM SOLVED: The Allens are now the proud parents of a baby girl, with lots of help from the even prouder grandparents. CALL NOW - FREE CONSULTATION! PROBLEM: Mary loved her grandkids. However, she lived on the East Coast, and they lived in the Stapleton area here in Denver. DECISION? She decided to move to Denver, and her kids built her an apartment over the garage. CHALLENGE: How to live comfortably in that tiny space! SOLUTION: Smart Spaces created a custom Murphy Sofa Bed that Mary uses as her daily bed at night as well as a living room during the day. 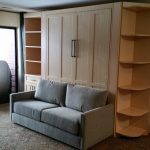 She chose a maple wood laminate for the cabinetry with stunning Champagne Leaf Chemetal Wall Bed Panels that serve as a focal point for her living room. 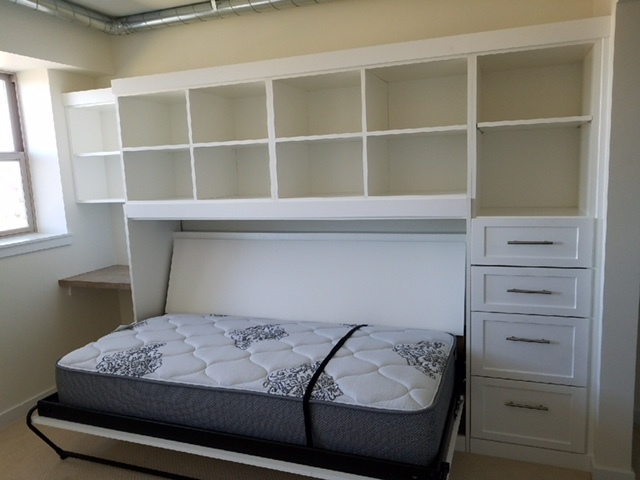 In addition to base cabinets on each side, Smart Spaces also placed cabinets on top of the bed-more storage space! Smart Spaces designed closets to fit under the sloping eaves, plus kitchen cabinetry. 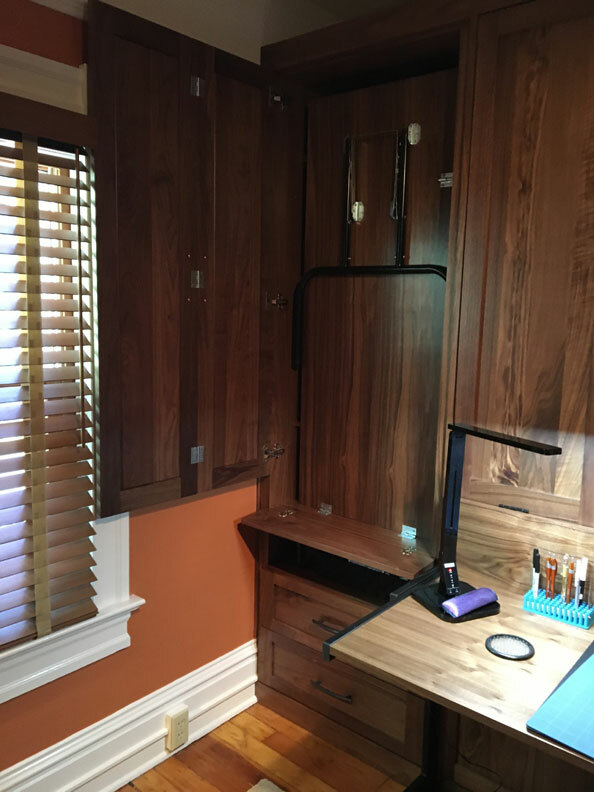 One of the kitchen cabinets included a drop table that Susan could use as her “go-to” table; when she needed more room, the table could then be folded back into place. The cabinet also included plenty of shelves to double as storage for plates and other kitchen items. PROBLEM SOLVED: Mary has both her individual space and her family nearby. 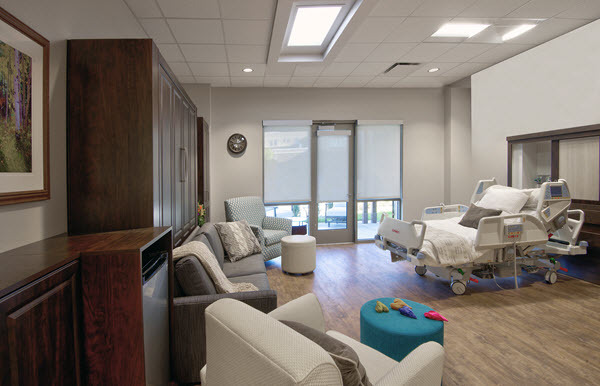 Smart Spaces Murphy Bed Showroom installed custom Sofa Murphy Beds into Centura’s Mercy Regional Medical Center as part of their recent renown renovation to their hospice care unit. 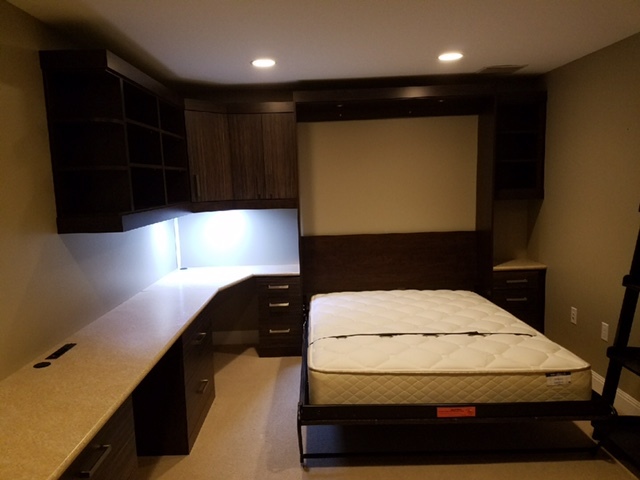 In addition to the hospital adding customized Murphy beds, Smart Spaces also installed customized cabinetry, sofas, wheelchair garages and closets for their guests. Is your space feeling more cramped than usual? Are you constantly tripping over furniture? Knocking over house plants? You don’t have to live this way! Turn your funky small space into functional space. Is this your bedroom? Guest room? 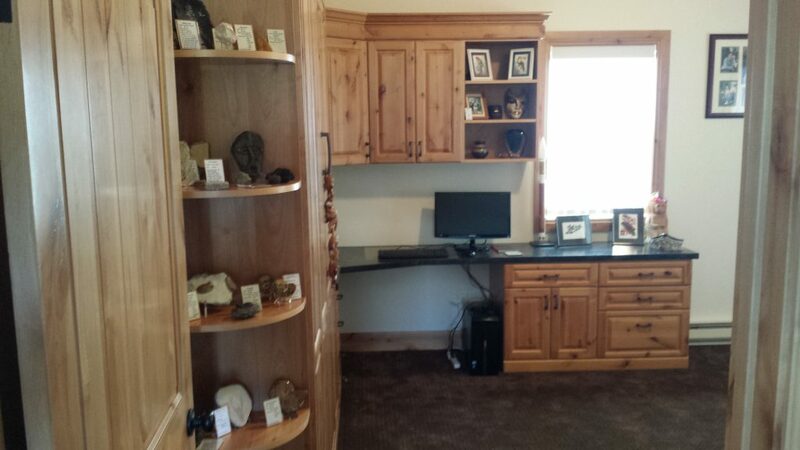 A home office? Or maybe it’s a combination space? The key to turning a small space into a functional one is to decide what the space will be used for. This will determine what furniture you need. It will also help you get rid of anything that doesn’t serve the purpose of the room. A quick way to make a small space feel cramped is to cover the floor with lots of bulky furniture. Turn empty walls into storage space to help get more things off of the floor. If you’re looking for a unique touch that will help free up space in your small room – take a look at this DIY floating string table from Monsters Circus. Does it feel like the walls are closing in around you in your small space? It might be due to heavy wardrobes, dressers, or storage shelves. Keeping everything enclosed can leave your space feeling cramped. 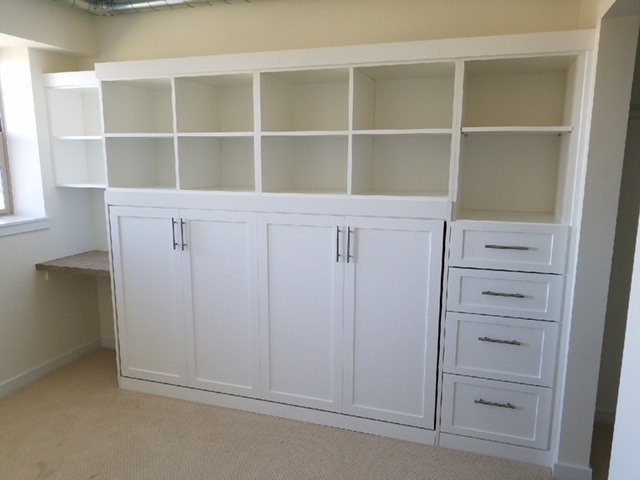 Create the illusion of space with exposed storage. It can be as simple as removing the doors to your built-in closet space. Your closet needs to be clutter-free in order for this to work! 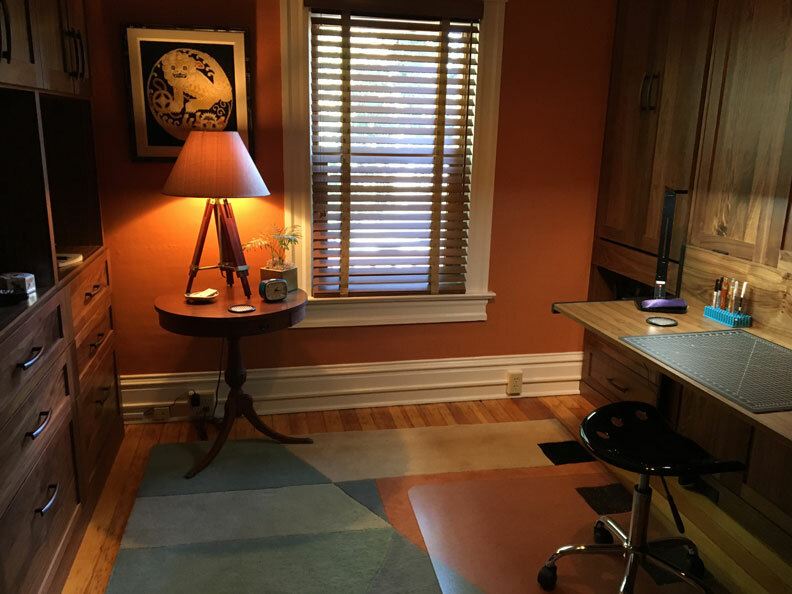 Need a desk for your home office, but also want to provide a bed for overnight guests? Don’t have a particularly high ceiling, but need somewhere to store a bed that’s out of the way? 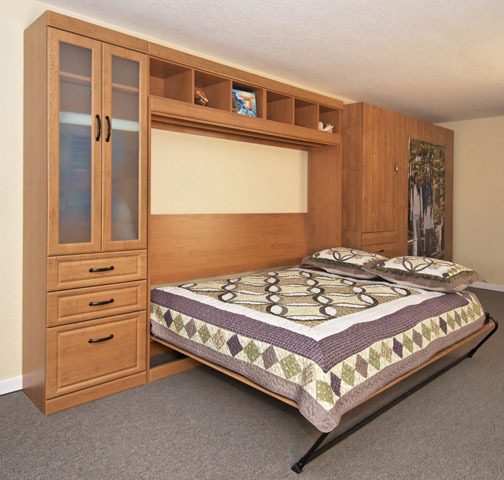 Look no further than a Murphy bed! They’re the perfect space saver that don’t force you to sacrifice on style. Murphy beds can transform your space into exactly what you need when you need it. Murphy beds can transform from a desk, shelving, or cabinet into a comfortable bed. Clashing colors and busy patterns do no favors for a small space. Simple yet structured patterns will help create a sense of calm and order. Lighter colors will help brighten up a small space while dark colors will make it feel smaller. 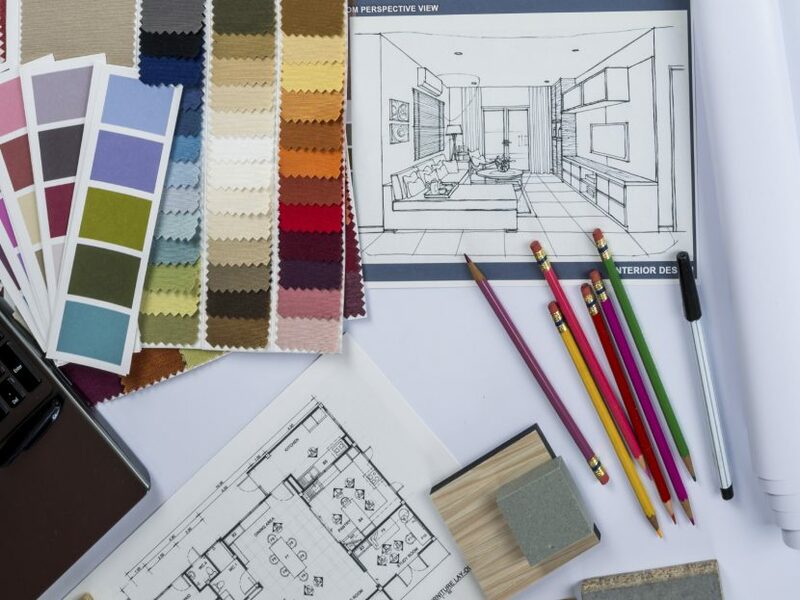 Make sure to always go back to the purpose of the room when deciding what color palate and design elements to include. Ready to turn your small space into a functional one? Set up an appointment with Smart Spaces today! Call Smart Spaces to schedule your FREE consultation and design! Turn your funky small space into FUNctional, today. The mandate of the recent international Solar Decathlon held in Denver was to focus on homes designed to be “affordable, innovative and highly energy efficient.” One of the ways that the student-led partnership between the University of Denver and UC-Berkeley showed their creativity was by using Murphy Wall Beds supplied by Denver’s own Smart Spaces. The team designed RISE for Richmond’s urban infill lots. RISE stands for Residential, Inviting, Stackable, Efficient, and can be used to describe the UC Berkeley/U of Denver’s design philosophy. Ready to scale to Richmond’s rapid, residential urbanization, this house design is community and transit oriented, focused on long-lasting, simple, and affordable infrastructure for the future. The simple but inviting structure includes large glass windows and doors on the south side, and the stepped-back structure and large stairwells promote community interaction. RISE is designed to be scalable and stackable, kind of like children’s blocks. The modular construction means that one, three, or five units can be built on a site, depending on the desired density. In addition, the post and beam structure directs loads through vertical elements, making the stacking process simple and flexible. Finally, RISE is efficient, designed to achieve net-zero energy consumption, to recover and reuse heat that is typically wasted in most houses, and to recycle greywater. The team also designed the house to be constructed efficiently, without specialized labor, so that local workers in Richmond can easily build the units. 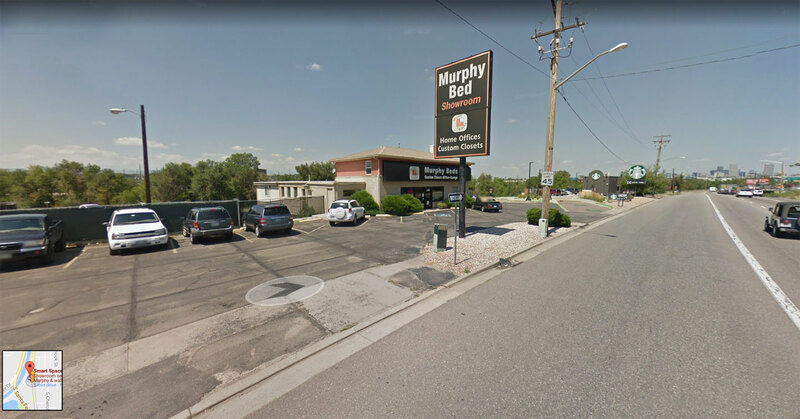 Located at 1295 S. Santa Fe Drive in Denver, Smart Spaces has designed and manufactured Murphy Beds, home offices and custom closets since 2004. Their 7500 square foot facility includes a two-story showroom with over 30 floor models on display. In addition to donating the Murphy Beds and cabinetry, Smart Spaces also gave some hands-on instruction on woodworking to the students, adding another skill to the ones learned by them throughout their 2-year-long project. 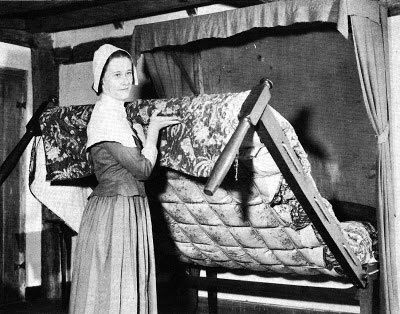 Part of the DU-CU-Berkeley bedroom design included moving walls on tracks so that during the day, not only did the vertical beds close up against the wall, but the actual walls moved in towards the bed, allowing over 350 more cubic feet for the communal living area. DU-UC-Berkeley ended up third out of thirteen in the competition, narrowly beaten out of second place by the University of Maryland. Their house is going to Denver Habitat for Humanity, which plans to install the project on a temporary lot while they prepare a permanent lot for the house. After installation on its permanent lot, the home will be sold to a family in need. 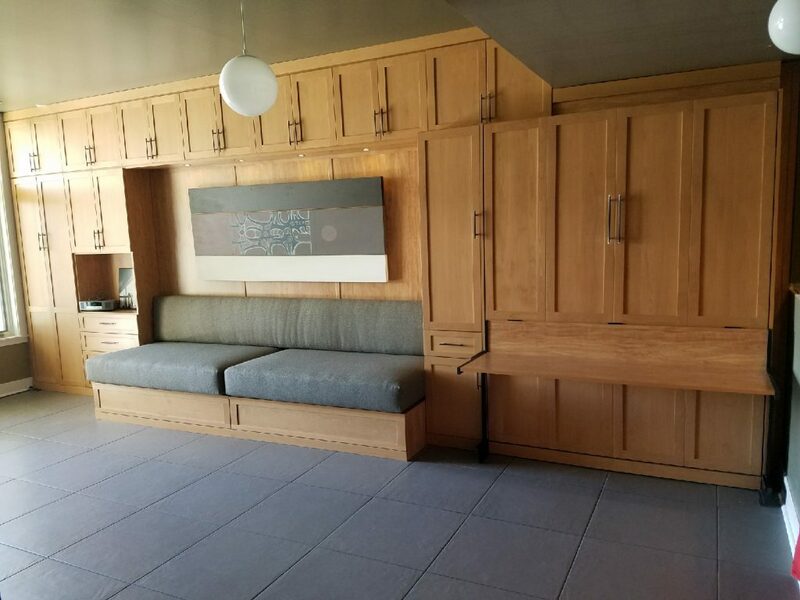 Check out the project and see our Murphy Bed installed! 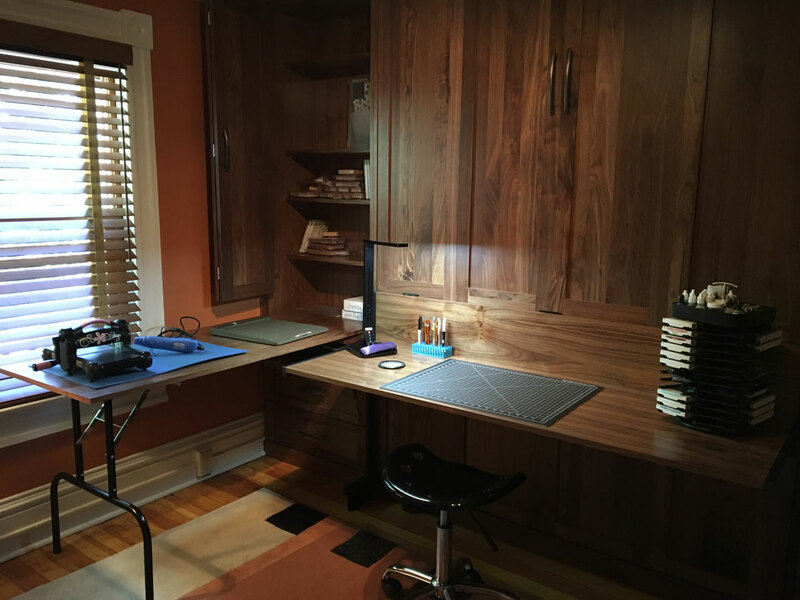 Thank you, Smart Spaces Murphy Bed Store in Denver, for all of your help in making our Murphy bed an excellent solution for our home office space and spare bedroom needs. 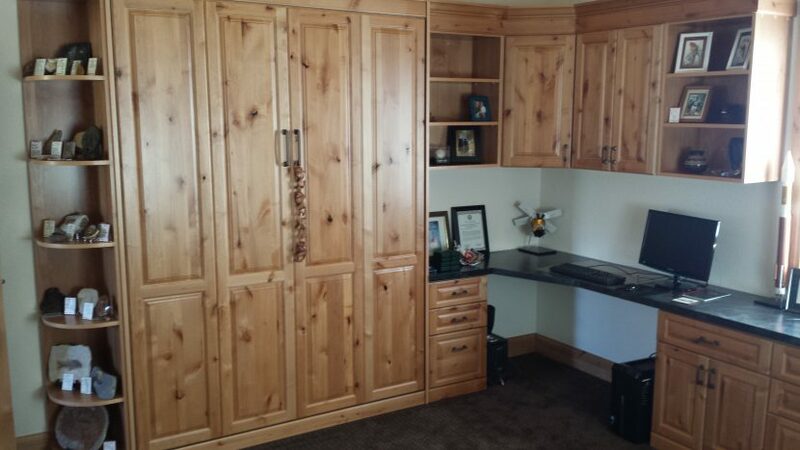 We are very pleased with the final installation and quality of this Murphy bed and desk unit. The woodwork is an absolute match for our room and we couldn’t be more pleased. All functions; drawers, cabinets, bed supports, etc. operate perfectly. 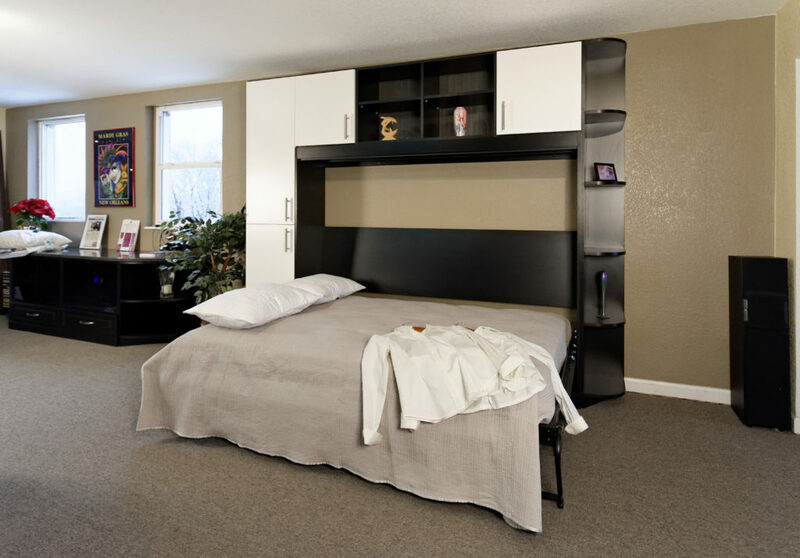 As for the installation, your Murphy bed installation team’s service is top notch! They were courteous, professional, very pleasant to work with–overall, they did an excellent job. Their attention to detail and the finishing touches make this a piece of furniture we are proud to display and use. You are lucky to have such a dedicated team working with you, congrats. Most of all, I would like to thank you for your commitment to keeping your word on the installation date. It seems today, that when companies or contractors provide a date, it doesn’t really mean anything. When we signed the agreement with you, you committed to a date and you kept it. Thank you. In closing, we couldn’t be more pleased having worked with you, the quality of your Murphy bed product and your installation team. Are We the Best Murphy Bed Store? as well as the largest Murphy bed showroom! Smart Spaces is the price leader for the quality, service, installation, and support. Do we sell the cheapest possible product at the lowest price? NO! Do we pay any franchise fees? NO! 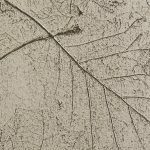 Do we ONLY offer the highest quality of materials? YES! Do we have the MOST space design experience? YES! Do we offer a great warranty? YES! Do we offer the HIGHEST level of product customizations? YES! 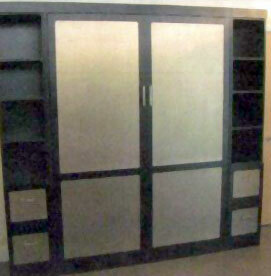 Do we have the LARGEST Murphy Bed & Wall Bed showroom? YES! Do we pay for commissioned designers? NO! Your prices DO generally include: delivery, installation, a high-quality mattress and an extensive choice of handles. Always ask if your furniture is made locally. It’s really important! Our unique, on-site manufacturing allows extensive customization. We assure that you will receive personalized service, professional, experienced designers and that we are dedicated to customer satisfaction. You can always call us if you ever need the furniture moved or fixed in some way after it’s installed. Come check out our 5,000 sq. ft. showroom in south-central Denver. On display are over 30 models and designs and user-friendly information about every aspect of our Murphy Beds. You will learn about different types of wood, wood veneers, thermofoils and melamines as well as other incredible laminates. 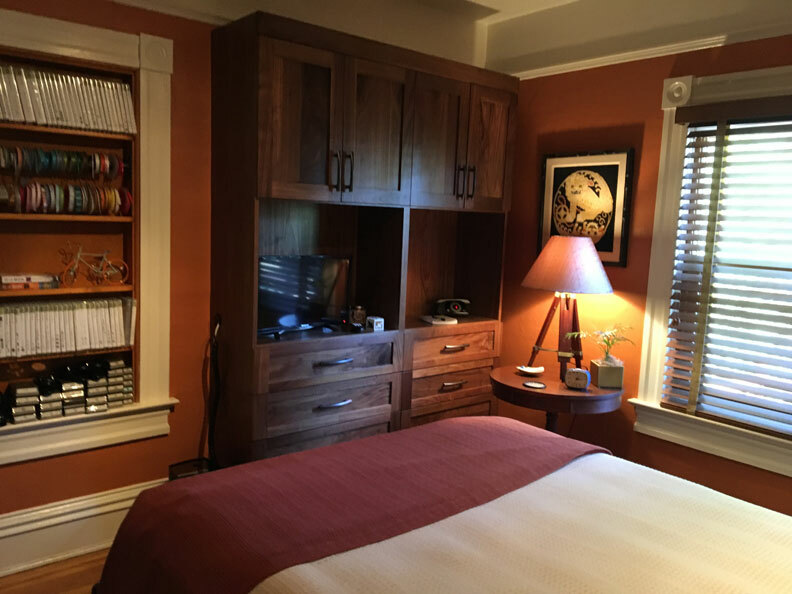 Check out our Murphy Bed spring-loaded mechanism, and see the widest array of accessories, upgrades, and the Murphy Bed installation process. You have a choice of Therapedic mattresses – inner spring, pillow top or gel foam. 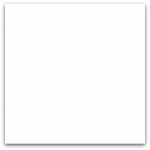 Countertops are available in laminate, solid surface, or granite. Need more options or have different ideas? Bring them in! Customers’ first question when they walk into our showroom—is about the type of quality we offer over the competition. Everything we use is first class. 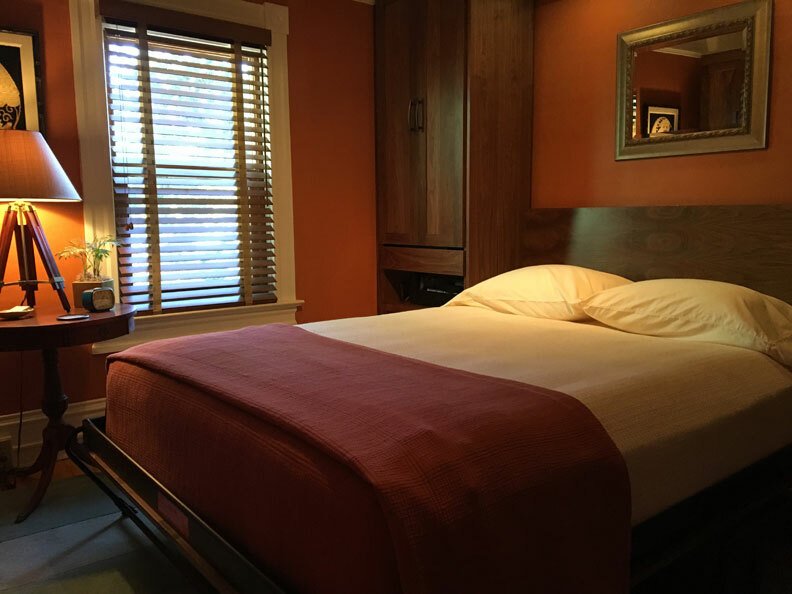 Our Murphy Bed mechanism, our materials, our mattress—ONLY THE BEST. In addition, our warranty models that of other, high quality furniture stores. Our employees are full time, not subcontractors, and they both manufacture as well as install our furniture. With years of experience, they are well prepared to think on their feet and come up with solutions to on-site installation challenges. Smart Spaces has over 4,000 installations—which means that we know what we’re doing. On-site manufacturing including our accumulated experience translates to customization, flexibility and great communication between you and your designer. 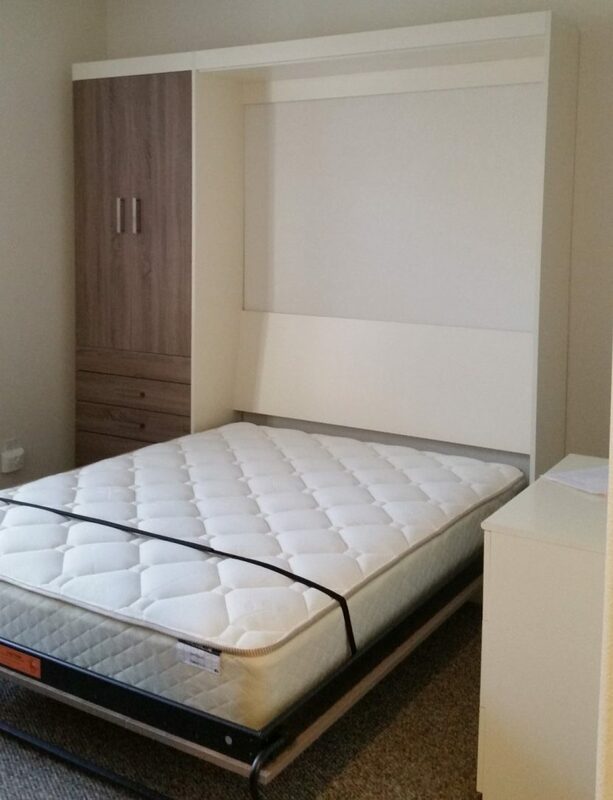 Had our first house guests this weekend, and we were excited to have the best Murphy Bed installed, by Smart Spaces, in time for them to use. Having a Murphy Bed allows us to more effectively use our small space for a play room for the majority of the time, and for guests to use when in town. 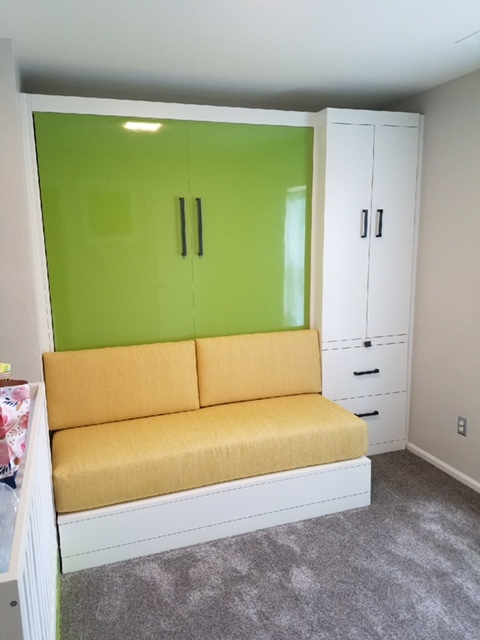 Smart Spaces Murphy Bed Store did a fantastic job working with me on the perfect design. The installers were professional and efficient. The quality of the materials and mattress are wonderful! ASTOUNDING customer service from Smart Spaces. Awesome products. I couldn’t be more impressed… so I asked them how I could leave a review? No prompting required. From the very first phone call with Jennifer, for information about Murphy Beds—to the excellent install by Jonah & James—my experience has been absolutely great. I can’t remember being so happy with a transaction. These folks are the best, and their product is, too. Thank you so much. The entire experience with Smart Spaces has been wonderful and we couldn’t be more pleased! It is as though we have a whole other room to our small condo. We now have a beautiful office with a couch for reading and a Murphy Bed for guests. The quality and style is both top notch and beautiful. Steve and Deb gave us personalize attention and the install went very smoothly. We have never met more professional and courteous guys. I have already recommended them to friends. Thank you. Thank you for ranking us as the BEST Murphy Bed Store! 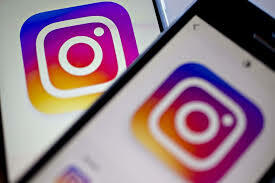 Share your Smart Spaces installation photos on Instagram! Easy to do, please follow these steps. You recently chose Smart Spaces for your custom furniture purchase. It is our goal to follow up and ensure that every aspect of the sale and installation process exceeds your expectations. As a valued customer, your opinions are important to us. Please take a moment and rate your total experience shopping with us at Smart Spaces. The answers you provided will help us to improve our processes and make our customer’s experiences even better. Smart Spaces uses only the best materials to manufacture your furniture. From woods to sheet goods, stains, the ISO 9002 certified lift mechanism, countertops on down to hardware, finer materials cannot be found. End products that you can trust and be proud of for many years also have a lifetime warranty against defects. 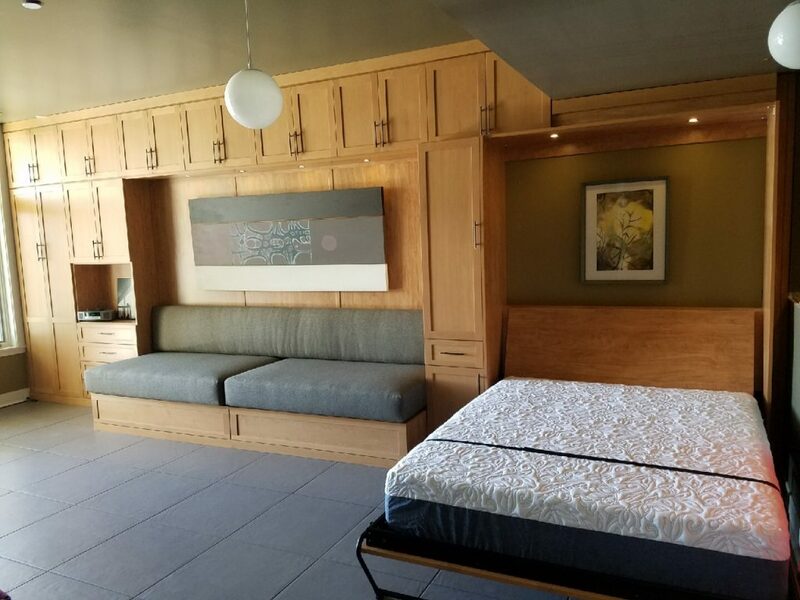 Our two-story showroom has over 20 Murphy and Wall Beds showcased in a wide variety of displays to help you visualize the best use for your space. A larger selection does not exist anywhere. 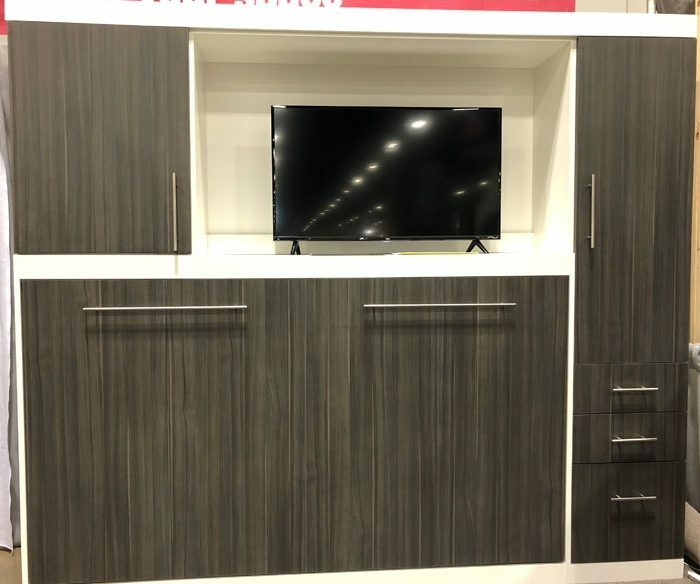 Solid woods, veneers, thermofoil, chemetals and melamines – including the new textured styles – are integrated with dozens of customized cabinets that include shelves, drawers, doors and closets. However you’re looking to create additional functional space, we can help with innovative ideas and expertise. We are so confident—that we offer a price-matching or beat-any-price guarantee. Since first offering this deal several years ago, exactly zero customers have presented us with a competing offer. If a customer would do this, they would know that they would get the quality of the true professionals in the field, as well as the best price. Something to consider. 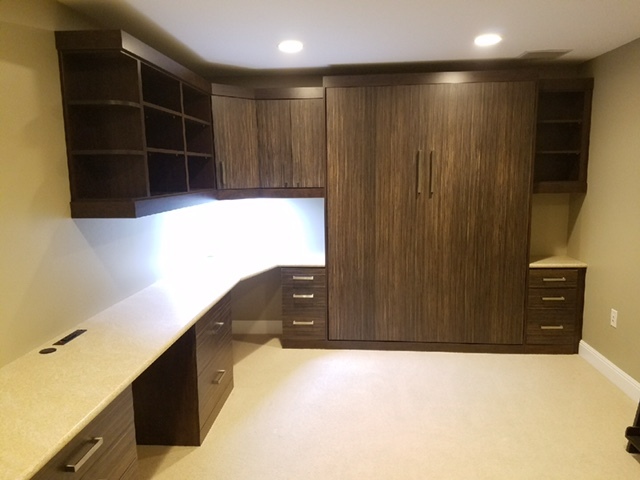 Since its founding in 2004, Smart Spaces has manufactured and installed over 3,500 Murphy and Wall Beds, home offices, custom closets and other custom cabinetry. Nobody else even comes close. Naturally, unparalleled experience translates into an acquired breadth of expertise and a corporate culture that prioritizes excellence, timeliness, and overall customer satisfaction. Our experienced designers are salaried and do not work on a commission basis. Our 7,500 square foot retail showroom and manufacturing facility is located on the northbound lanes South of Santa Fe Drive, south of downtown Denver. It is right off of I-25 which is important to our many customers who travel considerable distances to visit and shop. Smart Spaces uses the latest and most comprehensive software to design and manufacture your furniture. Our auto-CAD-based design software produces accurate dimensions and renderings for your visualization. It is seamlessly connected to our computer-driven saw which cuts the material in the most efficient and ecological way possible. Our installation teams work full time exclusively for Smart Spaces: we do not subcontract. Their acquired expertise allows them to make any adjustments that are required by your custom furniture installations on the spot. The teams also carry the tools in the delivery trucks necessary to fit and finish all of the furniture to your exact space. Almost all of the material that we use has a Colorado connection. Even if it is not manufactured in Colorado, it is distributed and received by us in Denver. It is then manufactured here in our 3,000 sqare foot facility by Coloradans for delivery to your home. Smart Spaces is owned by Coloradans. We are not a franchise and have only our one showroom and manufacturing facility. We do not pay a franchise fee and pass the savings on to you. If you’ve read this far, you need to visit us because you are an intelligent and informed shopper – our favorite kind. Let’s get started. Bring your needs, room dimensions and ideas. Need more than ten reasons to buy a murphy bed? 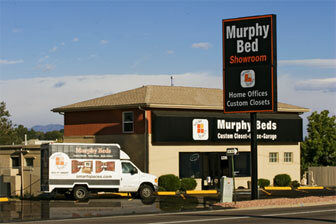 Come visit our showroom–the largest murphy bed store! While our job is to design, manufacture and install (or ship) all of the component furniture for your room, the process actually starts with the client. If you are just curious about our products we are always happy to speak with you or walk you around our showroom. If you have something in mind, though, a little preparation can go a long way. We offer free consulting and complimentary design services! allows the process to move quickly forward. For relatively simple designs we probably will not need an in-home consultation. Especially when we are shipping out-of-state we must rely entirely on you, the client. For rooms where measurements are vital to determine the design, one of us from Smart Spaces will absolutely be visiting. We will make the decision after speaking with you. This information allows the design of the furniture on our incredible computer aided design software. 3D renderings will help you visualize the product and how it will fit in your space. 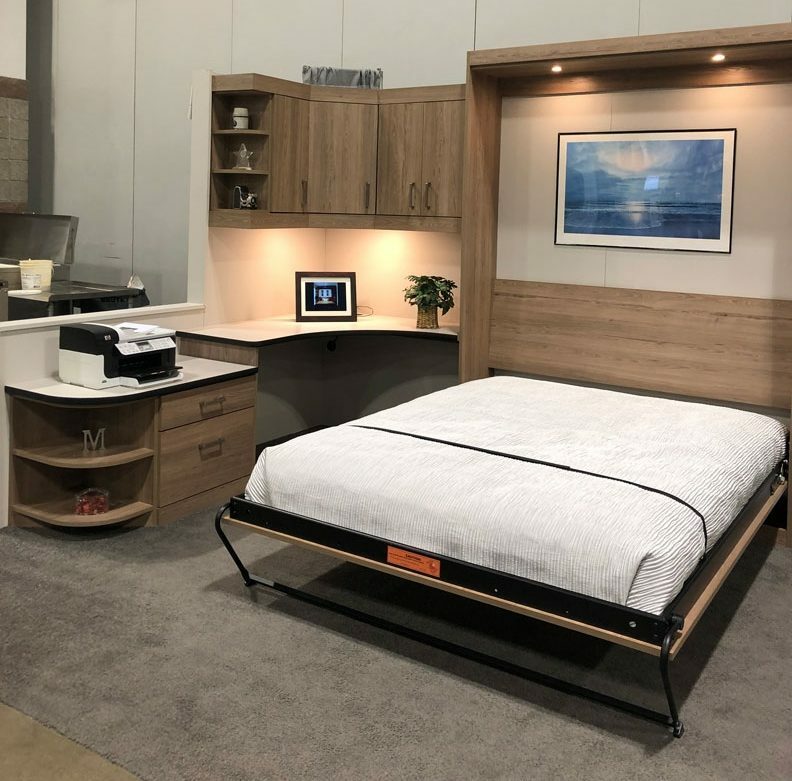 After ordering, Smart Spaces is responsible for manufacturing the furniture, collecting the other components (mattress, handles, counter tops, etc.) and arriving at your home at the appointed time. Our installers will then work with you regarding any final details, work expeditiously to complete the job, and clean up. After ordering, you also have a part to play: preparing the room. We highly recommend that we are the last ones in after the floors and walls are finished. Think of it as an opportunity to perfect the space. Also, the room should be cleaned out to the extent necessary. Enjoy your new space—designed and installed—by Smart Spaces! 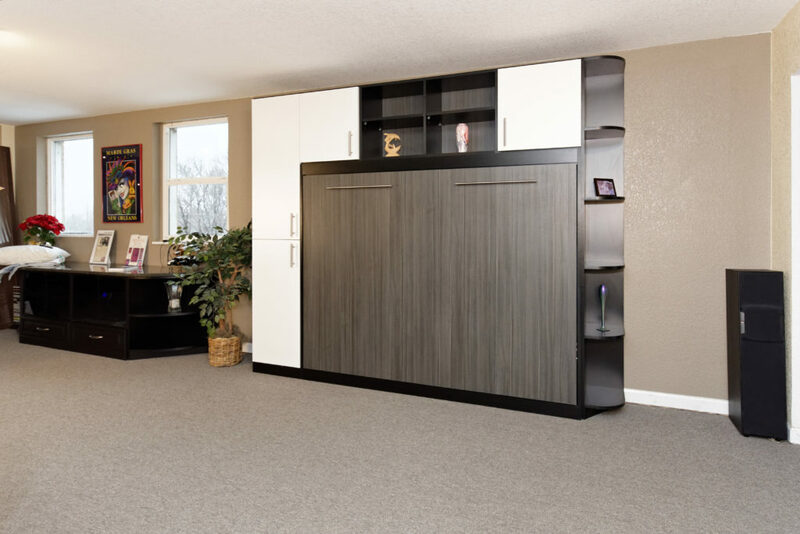 Murphy bed solutions designed just for you!